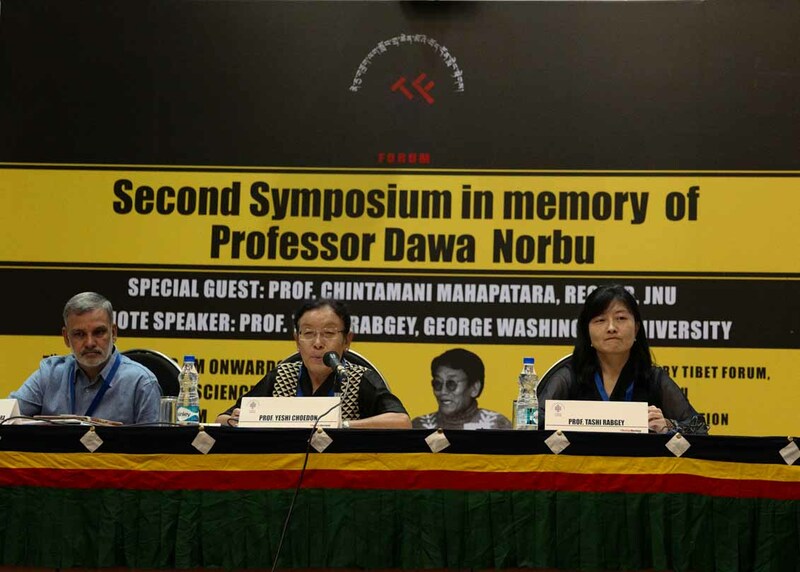 (TibetanReview.net, Apr11, 2016) –A symposium was held at the Jawaharlal Nehru University (JNU), New Delhi, on Apr 7 to commemorate the contributions of the late Professor Dawa Norbu and to further his legacy in the field of Tibet studies. The speakers included academics from the JNU as well as universities in other countries besides other research scholars, many of them Tibetans. The main objective of the symposium was to explore avenues for new discourses and perspectives on Tibet, ranging from the political to the sociological as well as the cultural. Chaired by Professor Yeshi Choedon, Centre for International Politics, Organization and Disarmament, School of International Studies, JNU, the keynote lecture at the inaugural session was delivered by Professor Tashi Rabgey from the Elliott School of International Affairs, George Washington University. She felt that there was a huge lack of dissemination of Professor Dawa Norbu’s works and also spoke about her field experience in China as a ground-testing of power-policy advocacy. She referred to online discussions on Tibetan public affairs and personal interaction with policy makers, researchers and students. Professor Bharati Puri, a student of professor Dawa Norbu, spoke on her research done on exile Tibetans. She explained how the exiles were struck in a limbo of their past memories and their longing for their homeland. It was her understanding that the education policy in the exile Tibetan Schools played a major role. Dr Tsering Chonzom from the Institute of Chinese Studies, Delhi, who spoke next, dwelled on the Tibet factor in Sino-India relations and recent dynamics in it like the Dalai Lama’s stand on Arunachal Pradesh. She also spoke on the question whether Tibet was a liability or a card or a strategic asset for India.The third speaker, Dr Dagmar Bernstorff, spoke mainly on her recently published book “Tibet: Theocracy to Democracy”. The book deals with the most recent developments in the exile Tibetan society which began with the Dalai Lama fully devolving his historical political powers to an elected Tibetan leadership in 2011. This session was chaired by Professor Sangeeta Thalpliyal, Centre for Inner Asian Studies, School of International Studies, JNU. The second session featured presentations by young Tibetan researchers and was chaired by Professor Varaprasad Sekhar Dolla, Centre for East Asian Studies, School of International Studies, JNU. The speakers were Dr Tenzin Desal, Mr Ugyan Choedup, Mr Rinzin Dorjee. They spoke on subjects such as the role of education in the construction of a nation in exile, the Politics and administration of Tibetan government in exile, about the Dalai Lama reincarnation issue in the context of Tibet’s future, and so on. The third session, which focused on ‘Tibet, China and Global Politics’, was moderated by Professor Srikanth Kondapalli from the Centre for East Asian Studies, School of International Studies, JNU. The first speaker Dr Dibyesh Anand from the Department of Politics and International Relations, University of Westminster, UK, said Third World countries had also colonized each other and referred to china’s colonization of Tibet, also referring to India’s stand on Kashmir. Dr Hemant Adlakha, from the Centre for Chinese and South East Asian Studies, School of Languages and Cultural Studies, JNU, then spoke about the contributions of former Communist Party of China General Secretary Mr Hu Yaobang and his contributions and policy- suggestions on Tibet in the 1980s. Professor SD Muni, Distinguished Fellow from Institute of Defence and Strategic Analysis, New Delhi, spoke during the valedictory function, which was chaired by Professor Dibyesh Anand. This was the second symposium organized by the JNU Tibet Forum, made up of Tibetan students of the JNU, in association with the Tibetan Review publication, Delhi, of which Professor Dawa Norbu was an editor in the 1970s. The inaugural session was held on Apr 7 last year as a tribute to the late professor.